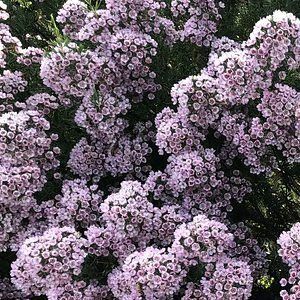 With scented foliage and pale plum pink flowers, Verticordia plumosa makes an impacting the garden from late spring to summer when it is in full flower. 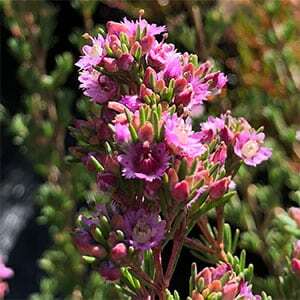 With its origins in Western Australia, it thrives in a well drained slightly acidic soil. Used in the garden where its flowers are the main attraction, this is a plant that also attracts birds and bees. A small shrub around 1 metre in height with a similar spread, it is best in full sun to a little afternoon shade. Like many Western Australian plants, this is one that is grown where the soil is mounded up to ensure good drainage, especially in the eastern states. It will grow well in many parts of Australia however it does not thrive in very humid climates. Like most in the genus, this is a plant that tolerates a range of soils including sandy and clay. Once established it is drought tolerant and very low maintenance. Also known as the plumed feather flower, a little light tip pruning immediately after flowering will keep the plant bushy and rounded. Do not prune back into old wood as it tends not to reshoot. Light pruning only. Spread – To a width of around 1 metre.